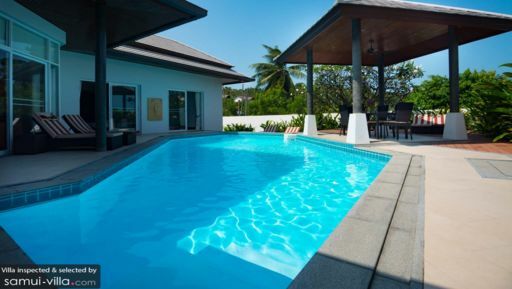 A tropical holiday villa on Choeng Mon beach, Samui, Villa Siam Noi is one of many luxury villas at Horizon Estate. With modern interiors and simple décor, the villa houses three bedrooms making it suitable for families, couples and even friends. If you are travelling for a special event, then this is the place for you as it is designed with maximum utilisation of space to give guests open concept living and dining area as well as a gracious pool deck. It is near the famous Chaweng beach that is home to some of the most popular restaurants and cafes in Samui. Villa Siam Noi offers three bedrooms that are well-furnished and spacious with modern comforts like air-conditioning, televisions and others. You can store all your belongings in the ample wardrobes. Two of the bedrooms are furnished with king-sized beds while the third is furnished with twin beds. Each bedroom depicts a unique colour scheme keeping with its tropical location. Enjoy a good night’s rest to wake up wholly refreshed and ready for another day. All the bedrooms have ensuite bathrooms with proper facilities for your convenience. With geometrical architecture, Villa Siam Noi incorporates its external elements even indoors with glass walls that overlook the vast expanse of lush flora around the property and the clear, blue skies overhead. There is a lavish swimming pool where you can even swim laps under the open skies, splash around with the children or sit hours by the pool catching up with your friends and family. Rattan sun chairs and the poolside sala offer much-needed rest to guests especially after tiring yourselves out while visiting the beach. The modern living area at Villa Siam Noi is designed with an open concept layout that allows you to enjoy the warmth of the tropical beach life even while you are indoors. There are glass doors that overlook the swimming pool and deck and allow abundant fresh air to circulate in the living area. Furnished with striking red couches and fitted with a flat-screen TV, DVD player, the living area will feel just like your home so you can find yourselves settling in without any problems. The spacious area has been designed with minimal accents to bring focus to the villa’s natural surroundings. There is a dining area where guests can gather and enjoy meals prepared in the fully-equipped kitchen. The kitchen is western with all amenities that you could possibly need to serve even seven-course meals. You will find that all the useful things can be purchased at nearby markets and local shops. With an entire team dedicated to look after your needs and cater to your requirements, you are definitely in for a treat. Villa Siam Noi extends its warm hospitality to its guests so that you can have a memorable stay without having to worry about housekeeping, security and maintenance. 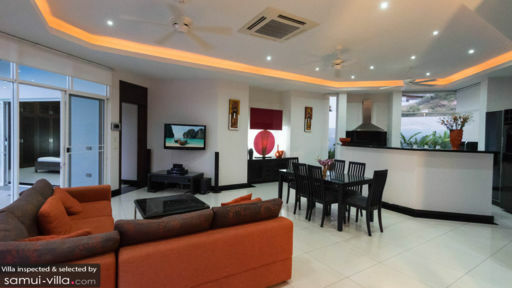 Horizon Estate also offers some shared facilities to guests of each of its villas. 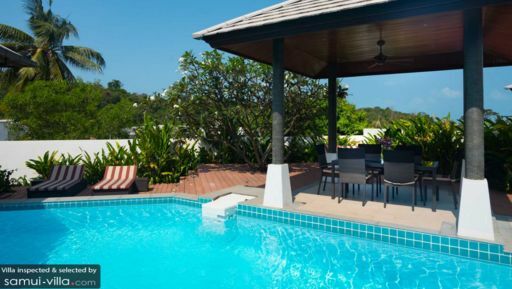 When you do feel like finally leaving the comforts of your villa, head on outdoors to explore the serene shores of Samui’s Choeng Mon and the more popular Chaweng area. You can visit the Big Buddha Bophut in the daytime and head to Q Bar or a beachside restaurant like Dining on the Rocks to end your night in the most memorable way. While the sun sets, Samui’s shores are awash with a golden glow that is a moment to remember.